Y.E.S. 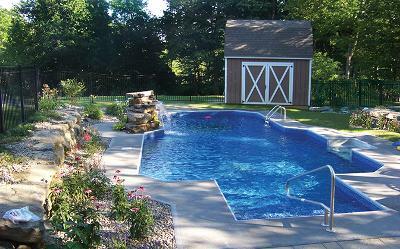 Contractors can install a beautiful new Radiant Pool on your property. Interested in installing a new pool for your home? You've got a lot of options available to you, but some are definitely better than others. Here at Y.E.S. Contractors, we find Radiant Pools to be some of the best. Radiant pools began in 1957 as Trojan Pools and manufactured the very first vinyl liner aluminum swimming pool. With over 50 years of experience, they now continue to innovate and provide ever more effective pool designs. Radiant Pools uses a combination of insulation and innovative engineering to manufacture some of the most unique and efficient pools available today. Interested in a beautiful, energy-efficient, and innovative new pool? Contact us today and have a Radiant Pool installed by your local pool installation experts in Wall Township, Brick, Point Pleasant Beach, and nearby! Varied Options: Radiant Pools come in three main varieties: metric pools, grecian pools, and inground pools. All of these designs can be further customized with a variety of different shape and size options. Advanced Engineering: Radiant Pools have always been unique in their structural design. They are currently the only swimming pools that are structurally insulated using an R-10 structural panel. These 2-inch thick wall panels are made of foam insulation sandwiched between two sheets of acrylic coated aluminum and are stronger and more durable than steel, polymer, or even 12 inches of concrete. Green: Radiant pool walls are more resistant to heat loss than any other type of pool wall thanks to the R-10 insulation. This allows Radiant Pools to better retain and use natural heat from sunlight. This helps you both save money on heating costs and also lets you help the environment. Radiant Pools are the only swimming pool manufacturer to be an Energy Star Partner. Warrantied: Radiant Pools all come with a lifetime, fully transferable, non-prorated warranty against manufacturing defects. This warranty can even transfer to the new homeowner should you ever sell your home, adding even more value. In the case of metric series pools, the warranty can even protect against the unlikely occurrence of winter damage. Get started today with a free estimate from your local pool installation experts! Radiant Pools are incredible feats of engineering that can mark a major improvement to any home. Interested in installing one for your home? Y.E.S. Contractors has the pool installation expertise that you need. Contact us today and schedule your free estimate for a new pool in Wall Township, Brick, Point Pleasant Beach, Belmar, Manasquan, Sea Girt, Spring Lake, Asbury Park, Farmingdale, Avon by the Sea, & nearby NJ! *$50 fee for above-ground pool installation estimates.